No market segment is immune to fragmentation, and this is especially true of luxury travel. In the recent upsweep of luxury experiences, two distinct types of experiences have come to the fore. One type has been termed ‘Luxploration’ and the other can be categorized as ‘one-of-a-kind’ experiences. Luxploration is a buzzworthy term and refers to the experience economy as it exists within a luxury context. It’s aimed at the travelers who fit the luxury price bracket, and who want all the comforts associated with luxury plus an adventure. It’s experiential, but it’s not necessarily authentic, self-determined, or unique. At Aspen’s Little Nell, adventure travelers can relax in style while enjoying the hotel’s slopeside Rocky Mountain location. There is a dedicated ski concierge who will warm your ski boots and the hotel gives guests complimentary “First Tracks” access to Aspen Mountain before it opens to the public in the morning. The Sheraton Maui Resort and Spa combines whale watching with indulgence, by offering a curated experience special deal called the “Sea S’more Whales package.” Families will get beachfront rooms and s’mores kits to indulge in while watching the whales from oceanside fire pits. Trips and tours within this category appeal to a traveler’s desire for a novel experience, rather than a transformational one. The experience offers something fun, and is carried out in style. “Luxploration means they’re going out and they’re exploring during the day and they’re certainly not roughing it” is how Jean Dickinson, Starwood Hawaii’s regional director of communications describes it. Rather than the understated version of luxury, luxploration really embodies the viewpoint that more is more. Guests who want an out-of-the-world experience, without compromising standard luxury hallmarks, are who these experiences are designed for. 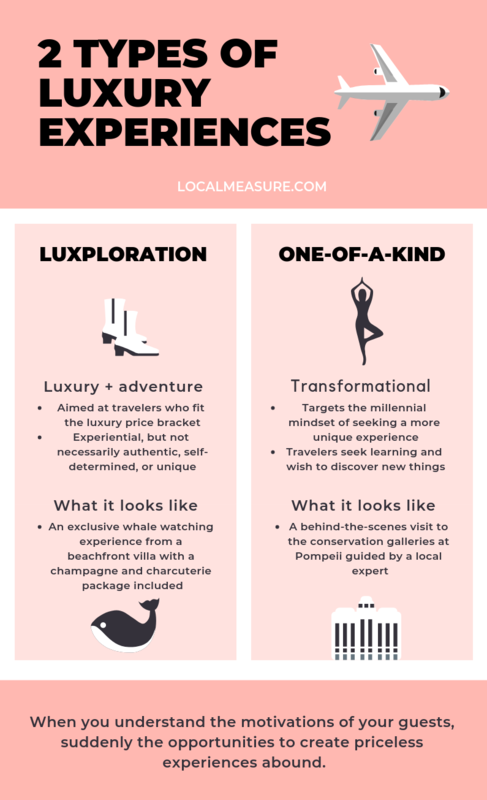 If luxploration seems too mainstream, another niche has emerged to suit individuals seeking a more unique experience. The transformational element of these experiences is manifest when the traveler is able to learn something or develop a new appreciation for something. This niche targets the millennial mindset – people for whom authenticity is important, but specifically for whom, self-determination is the strongest measure of authenticity. Per a recent Expedia study, an activity or hotel chosen by a tour group is not considered to be as authentic as one selected by a millennial traveler. “It is the perception of having chosen their destinations, activities and companions for themselves which underpins the feeling of authenticity.” This is not to say that travelers are eschewing professional advice, but they do want to be involved in the decision process. One way travel providers can create incomparability, is by emphasising the relationships and connections formed during the experience. Conrad Hotels defines their brand of ‘Smart Luxury’ as offering “one-of-a-kind experiences with sophisticated, locally inspired surroundings. Service is more than personal; it’s intuitive. Connections are made to people and places around the corner, and halfway around the world.” The offering is more like a travel guide than a travel package so that there is still an element of self-determination. It’s here where the margins for travel companies are greatest, not just financially, but in their ability to create an unforgettable experience – and a lasting relationship with their guest.